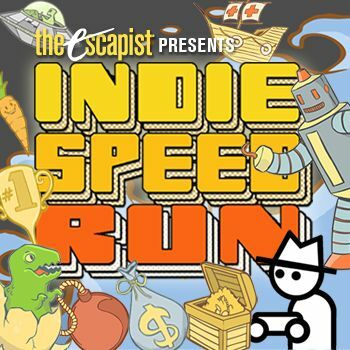 It's time to start announcing the Indie Speed Run finalists, starting with Trent Oster's pick! Starting tomorrow, we'll be announcing one game deserving of the title "Indie Speed Run Finalist" every 48 hours until the end of January, as chosen by our panel of industry judges. Each of these games will become one of the lucky ten to move forward into Yahtzee's domain for a shot at the $2,500 grand prize. The first selection announced will be Trent Oster's of BioWare/the recently released Baldur's Gate: EE fame. Come back to the game page tomorrow on January 18th to see which game he thought deserved a shot at the big win. Following soon after will be the selections of Kellee Santiago, Vander Caballero, Jason Rohrer, Ron Gilbert, Dino Patti, and Markus "Notch" Persson. While we're announcing which games the judges loved, how about you tell us which games you loved? Once the seven judge-chosen finalists have been chosen, your top three picks will be announced at the end of the month to join the others. Getting involved is as easy as playing free games and choosing between 1 and 5 stars! You can find out more about the competition at www.indiespeedrun.com!